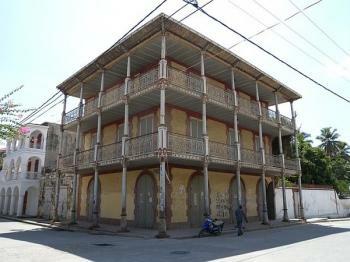 Centre historique de Jacmel is part of the Tentative list of Haiti in order to qualify for inclusion in the World Heritage List. I visited Haiti in October 2009, just a few months before the January 2010 earthquake. I made arrangements with Jacqui at Voyages Lumiere (voyageslumiere.com/), who I highly recommend. I based myself at the Hotel Oloffson in Port-au-Prince (hoteloloffson.com/), and visited the capital's principal sites, highlights being the Marche de Fer and Grand Cimetiere de Port-au-Prince. Jacqui also arranged a day trip to Jacmel, located on Haiti's southern coast, which allowed a drive through the mountainous countryside and a visit to Jacmel (similar in construction to the French Quarter of New Orleans, with its many 19th-century merchants' residences graced with wrought-iron facades). (October 2009) I visited Jacmel on a day trip from Port-au-Prince. It was an easy three hour drive up one of the best roads in the entire country and provided excellent views throughout. The city itself was very walkable and pleasant with nice breezes flowing off the Caribbean Sea. The old New Orleans-style wrought iron architecture was particularly attractive. Compared to the hustle of Port-au-Prince, Jacmel was a very laid back place and a great way to spend a day wandering around. I recommend hiring a driver to take you there for the day. The only other transport would be jam-packed buses that take much longer and are uncomfortable.